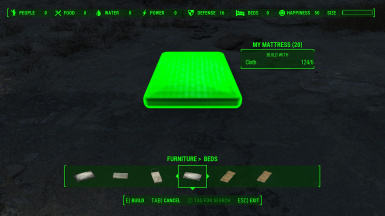 Adds six (or 13) craft-able beds that settlers cannot sleep in...but you can. Removed the "My Beds" category from the extended version and placed all of the personal beds in the vanilla "Beds" category. This should remove any conflicts with other home-crafting mods. Please read the sticky post for further details. Renamed all of the beds to "Bed (Mine)", "Mattress (Mine)" and "Sleeping Bag (Mine)". You worked hard to get your settlement established and now people are coming in; welcome home. You have plenty of crops ready, plenty of water and plenty of beds. You even have a place to lay your head when the hour is late. So what happens? 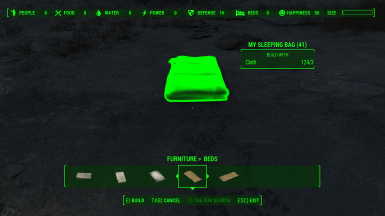 Some damned settler decides that (s)he wants to sleep in your bed! No! No! Out! This is MY bed! 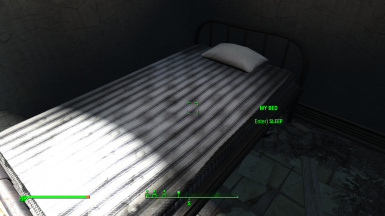 Then another settler wanders in...and takes your bed again! What to do? Well, here's your answer. 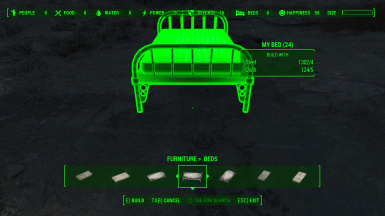 This Is MY Bed adds versions of the vanilla craft-able beds that the settlers cannot claim. 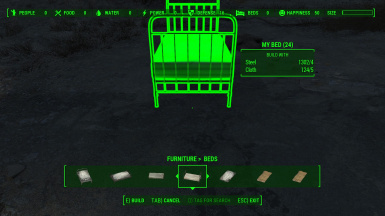 These beds have no resource requirement, meaning that settlers cannot be assigned to the bed, and do not count toward the number of beds in your settlement. So you can work hard to make your new community work, knowing that there is a place just for you...to sleep. This is MY Bed comes in two flavors, basic and extended. The basic version only has personal versions of the six stander home-crafted beds (metal bed, Vault bed, hospital bed, mattress, military cot and sleeping bag.) 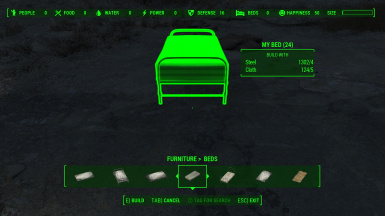 The extended version comes with seven additional beds (2nd Vault bed, The Institute bed, hospital mattress, metal and Vault bunk beds and wood and pre-war double beds.